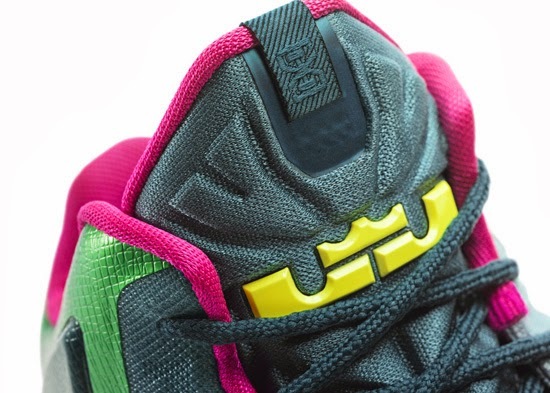 This LeBron 11 was made with the kid's in mind and will be available at the end of November. 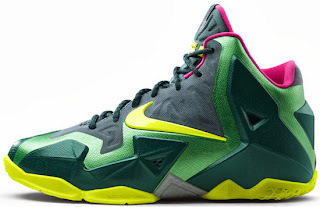 Nicknamed the "T-Rex" edition, this Nike LeBron 11 comes in a gorge green, volt, rave pink and armory green colorway. This colorway was inspired by the king of the prehistoric world, the Tyrannosaurus Rex. The volt color on the swoosh and outsole represent a T-Rex's glowing eyes, while the two shades of green and textured upper draws inspiration from a T-Rex's scaly skin. The pink around the collar represents the dinosaur’s mouth. They were made with the kid's in mind and will be available exclusively in kid's sizes ranging from GS (gradeschool) big kid's all the way down to infant. A general release, look out for these at select Nike accounts worldwide on Friday, November 29th, 2013. Retail price is to be announced. Once it is, I will make an update and let everyone know. Enjoy the official images below of the "T-Rex" Nike LeBron 11 GS in gorge green, volt, rave pink and armory green. If you're interested in picking these up when they release, check in with your local spots to see if they will be receiving them. Those of you looking for a pair now can, grab them from eBay here.